Late May saw 11 CURE members heading to the Lancashire hills so as to create a dedicated time and space for developing and reflecting on the Centre’s work. CURE has grown rapidly over the past year with new members of staff and PhD students from a wide range of areas of expertise joining the research centre. The event was a welcome opportunity for old and new CURE members to get to know each other better, as well as to co-create a joint vision for CURE’s future work and hence align the group’s agenda with its members’ interests and areas of scholarship. The away day started on a Sunday afternoon with a social bike ride from Manchester to Hebden Bridge along the Rochdale Canal. 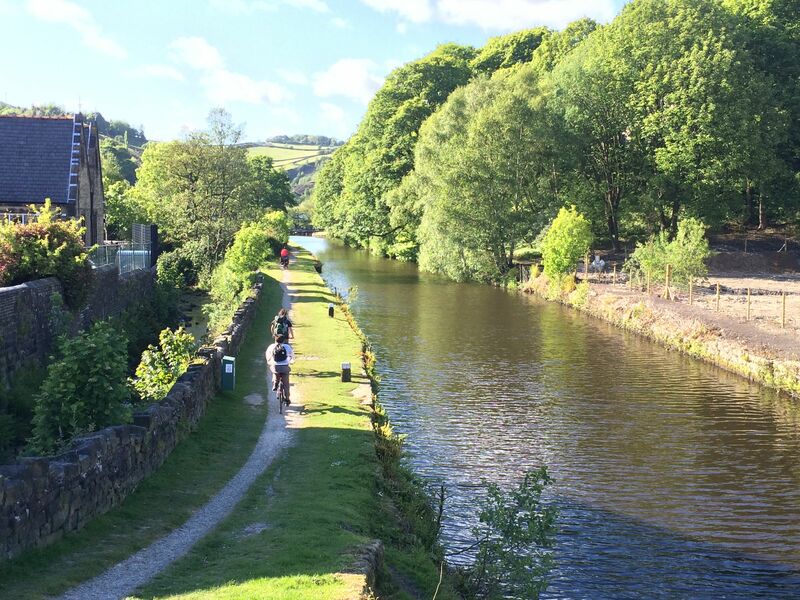 Despite pre-existing perceptions that cycling to Hebden Bridge via the roads is quite a climb, on the canal it was a pleasurable (and relatively flat) route which our group would recommend to anybody. It also had a couple of excellent pub stops on the way! CURE members cycling along the Rochdale Canal. Photo by Gabriele Schliwa. The cycle ride is part of Sustran’s route 66 and more information on the route can be found here. In order to exchange knowledge with sustainable projects in the local area, the first day started with a tour of the Incredible Edible Project in Todmoden. Incredible Edible is a movement that encourages growing locally and campaigns on local food production. Born in Todmorden, it began as a ‘guerrilla gardening’ project, creating herb beds in the town centre that local people could then enjoy and use. From humble origins, the idea has now been picked up around the world through the Incredible Edible Network. There are over 100 Incredible Edible groups in the UK in addition to groups in Canada, Australia, USA and China.. To have inspired an international network of local groups so quickly – Incredible Edible only began in 2007 – demonstrates the speed with which connections can be made and new ideas spread in this digital age. Thanks from CURE for the tour, Incredible Edible! 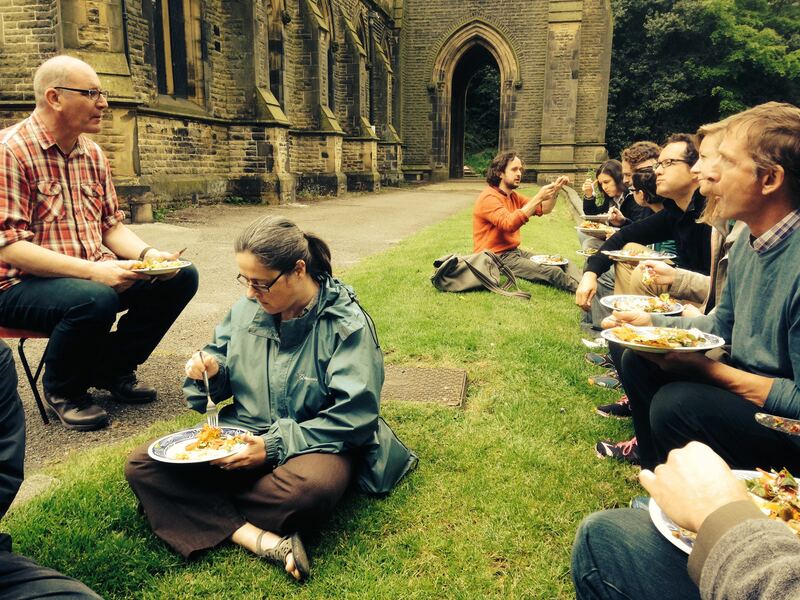 Visiting the Incredible Edible initiative in Todmorden (photo by Saska Petrova). The most productive and interesting part of the trip was the CURE workshop, held in Hebden Bridge Town Hall. 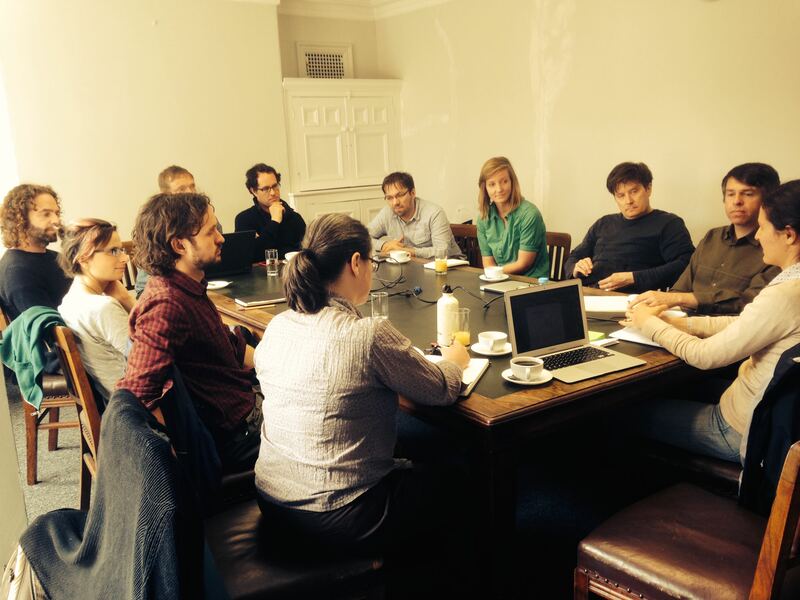 With presentations and a roundtable discussion, we each spoke about our own research interests and how we envisaged working with CURE in the future [photo of workshop]. As a research centre at the University of Manchester these discussions are an opportunity to build our projects and interests into a broader CURE vision. 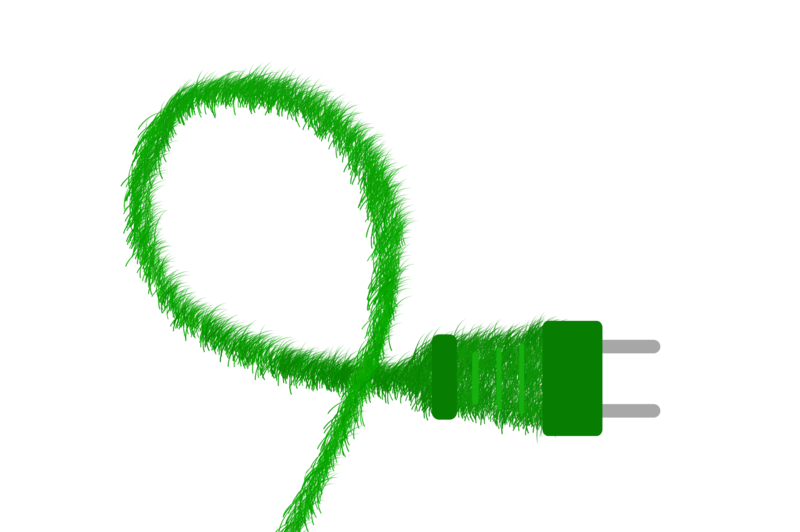 CURE is an interdisciplinary research group with expertise from across the School of Environment, Education and Development. What we share in common is ‘real world’ foci around energy and transitions, foresight and resilience, climate change and urban research. While from the outside a research centre can appear as a single entity, as with all of the best things in life, take a closer look and it is a lot more complex and interesting. The Centre has multiple simultaneous functions, operating as a research hub but also connecting policy to practice and engaging with non-academic partners and audiences. This has included working with Greater Manchester governance institutions and decision-makers, partnerships within local authorities (e.g the Wildfowl & Wetlands Trust), networks with European cities and engagement with local NGOs and community organisations. The CURE workhsop in Hebden Bridge (photo by Saska Petrova). Future links discussed at the workshop included with activist organisations and community groups, with CURE operating as a host for relevant community events. On a conceptual level, CURE also creates a space in which current paradigms can be critiqued and alternative possibilities imagined. The position of CURE across multiple disciplines means that there is an opportunity for us to take a strategic role in the University as a hub across faculties for researchers addressing common ‘real world’ themes. Put another way, it is a space in which disparate groups from across university disciplines can come together over the common issues that they seek to address. Workshops and events like the CURE away day are vital for checking the ‘pulse’ of the group and ensuring that we understand the ways that CURE engages both within and without academia. This was an opportunity to update each other on our own research and to explore possibilities for new research and events in the future. The discussion was lively and it was helpful to share our respective research interests and to highlight our common themes and approaches.